Now that we’ve decked – and undecked – the halls for the holidays, this is the ideal time to design your home in a look all your own that delivers timeless functionality every day of 2011.
retail catalogs? 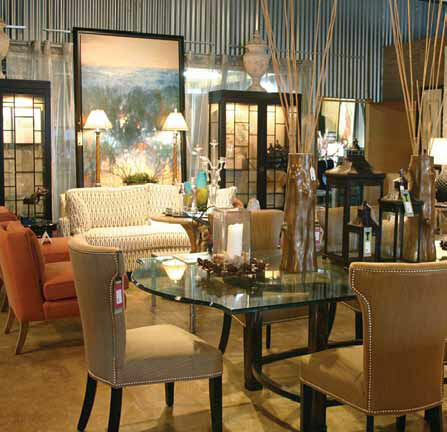 Savvy Charlotte homeowners have known the secret for a while – 10 years to be exact – of shopping at The Furniture Connector for fabulous furniture at affordable prices. When you cross the shop’s South End threshold, be prepared to be awed – and to enjoy your time within, often not something associated with furniture shopping. The beautiful display of designer market samples and closeouts comprise a broad range of styles for furniture, lighting, accessories, and art. For an advance glance at the newest items, peruse the Web site’s “Off the Truck” section. Stop in The Furniture Connector at 2905 Griffith Street, located in South End, Wednesdays-Saturdays 10-5 and Sundays 1-5; call 704-507-9023, or visit http://www.thefurnitureconnector.com to see the new site that beautifully captures the culmination of a decade of change. You can also find the store on Facebook and Twitter.